Alrighty now, back to Italia. 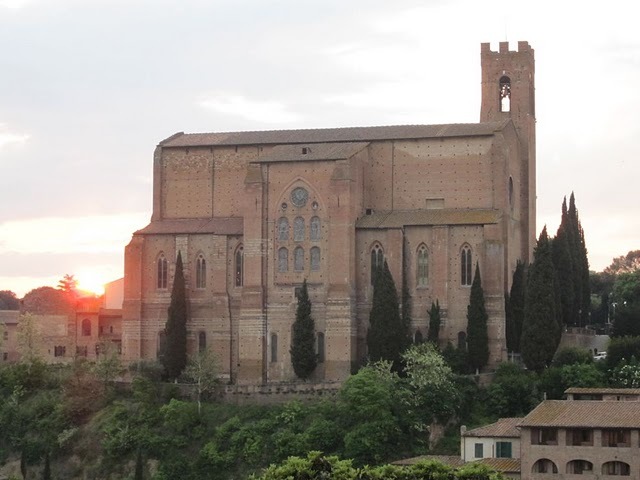 Remember we’ve done 2 nights Venice, 2 nights Florence, 2 nights Greve-in-Chianti, and now it’s time to blog about my namesake’s home, the medieval town of Siena. 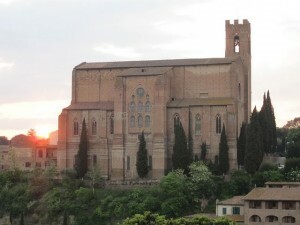 I was named after St. Catherine of Siena so this place holds special meaning for me and my parents. Interesting fact: Siena’s patron saint was a writer which means I’m totally following in her footsteps, though I’m certainly no saint! We had the pleasure of celebrating St. Catherine’s feast day in Siena. The city was decked out in flags and there was a big parade with guys dressed up looking like jesters. I couldn’t stop giggling, watching these grown men in tights. Driving into Siena drove us C-R-A-Z-Y. There were all these roundabouts, limited driving zones, and numerous permit signs for parking. There isn’t a parking situation in SF or NY that’s worse. We were driving around in circles, trying to find our hotel which apparently was next to a church. It was a hell of a time! I was swearing, Dean was swearing. The church bell’s ringing. And there were all these Filipinos walking around with bright orange visors that read CATHOLIC TRAVEL. My parents tipped me off to a website called MonasteryStays.com. You can book cheap accommodations in monasteries all over the world. 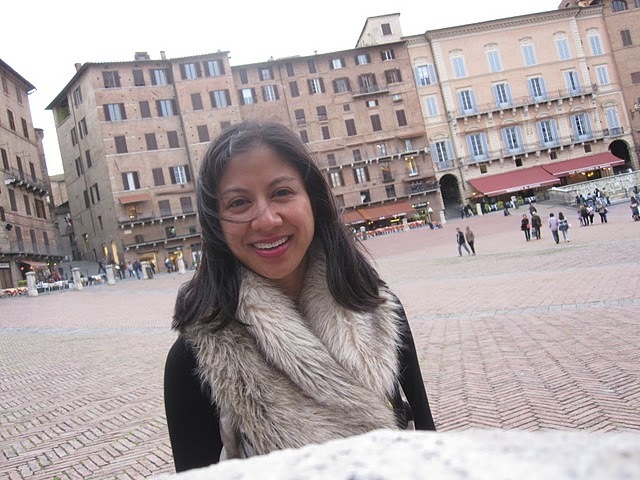 There were a ton in Italy, but only one in Siena. It turned out to be a retreat center instead of a monastery, but we appreciated the cheap lodging. Oh and the 2am curfew and the separate twin beds. Thanks Mom and Dad, it appears you don’t want grandchildren. 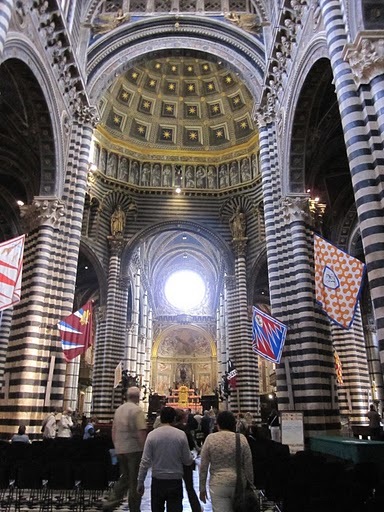 I won’t bore you with details, but of all the churches we went to in Italy the Duomo in Siena was the best. It’s made of distinct black and white marble inside. There was artwork everywhere, even all over the floor. 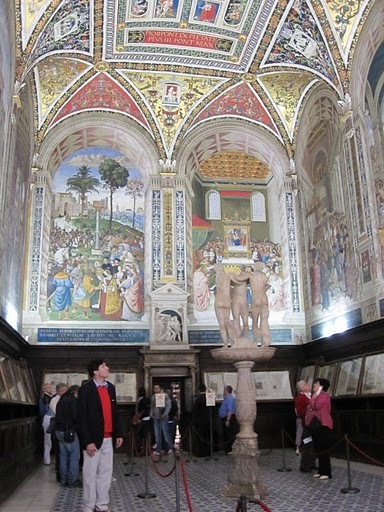 There was a library inside that reminded me of the Sistine Chapel with colorful paintings on the walls and ceiling. Siena was charming, but I can see why people come to visit during the day then leave. You can tour the Duomo, St. Catherine’s Sanctuary, and hang out in the main square over the course of half a day. That said, my best meal on the trip up to that point was a dinner in Siena and we discovered a local hot spot called the Tea Room. What? We kept looking around. The old woman on the bench grunted, “Follow me. They’re saying follow me.” The young couple smiled with affirmation. That’s it! They led and we followed as they walked us to where we needed to go. Those old people sure are wise.